FILE - Britain's Foreign Secretary Boris Johnson talks to reporters as he arrives at a European Union foreign ministers meeting in Brussels, Belgium, March 19, 2018. FILE - A van pulls into the grounds of the Russian Embassy in London, March 20, 2018. 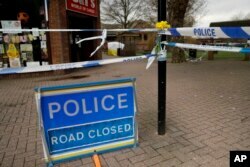 FILE - Daffodils are placed by a police cordon backdropped by a tent covering the area where former Russian double agent Sergei Skripal and his daughter were found critically ill, March 13, 2018. Some material for this article came from AP, Reuters, AFP and BBC.